In 1799, a naval war was being waged between the United States and France under the Directory. When he become First Consul, Bonaparte, who was an admirer of George Washington, at once attempted to restore peace and friendly relations between the two nations, which at the time, were the only two major republics in the world. With this purpose in mind, he invited President John Adams to negotiate. Adams named three plenipotentiaries, who arrived in Paris on April 2, 1800. The First Consul also named three negotiators to represent France. As we saw in the preceding chapter, he had to leave for Italy at that time in order to halt the advance of the Austrian army. 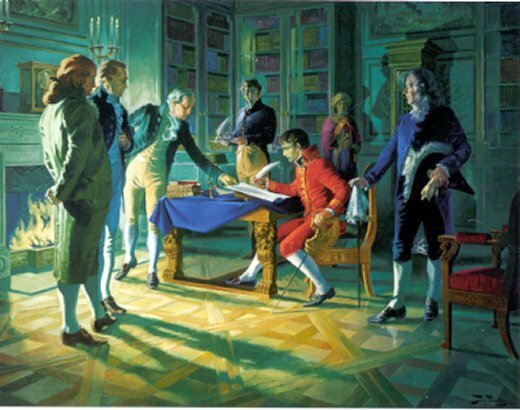 On his return to Paris, he stepped up the pace of the negotiations, and the convention was signed at the château of Mortefontaine on September 30, 1800. This very beautiful forty-room château, which today is an important historical site, still looks just as it did in 1800. It is set in a thirteen-hectare park, only ten kilometres north of Charles de Gaulle airport (35 km. from Paris, at the Survilliers exit on the Paris-Lille autoroute). Be it enacted by the Senate and House of Representatives of the United States of America in Congress assembled, that the United States are of right freed and exonerated from the stipulations of the treaties, and of the consular convention, heretofore concluded between the United States and France; and that the same shall not henceforth be regarded as legal obligations upon the government or citizens of the United States. “The First Consul of the French Republic in the name of the French people and the President of the United States of America, equally desirous of ending all differences that have arisen between the two nations, have respectively named their plenipotentiaries, and have invested them with full power to negotiate on these differences and to resolve them. To wit, the First Consul of the French Republic, in the name of the French people, has named as plenipotentiaries for the said Republic State Councillors Joseph Bonaparte, Charles-Pierre Fleurieu and Pierre-Louis Roederer. (The twenty-seven articles specify, down to the smallest detail, the conditions of navigation and the amicable rules that will apply at sea and in port between the navies of the United States and France). In witness whereof, the respective Ministers Plenipotentiary have signed the above articles both in the French and English languages, declaring nevertheless that the signing in both languages shall not be cited as an example, and shall prejudice neither of the parties. Signed in Paris, on the eighth day of Vendémiaire of the ninth year of the French Republic, and the thirtieth day of September, 1800. To celebrate the reconciliation with the United States, the First Consul decided to stage a great celebration at Mortefontaine, on October 2 and 3, 1800. The Baron de Méneval, who at the time was secretary to Joseph Bonaparte, before becoming Napoleon’s own secretary, has left us an account of the event in his Memoirs: “The festival at Mortefontaine was superb; the beauty of the site contributed greatly to the good taste and the magnificence of the event. Napoleon was there with his family. General Lafayette and Monsieur de la Rochefoucauld had invited every American in Paris. There were many pretty women, including two young sisters of the First Consul, Mesdames Leclerc (Pauline, 20) and Murat (Caroline, 18). And it was, but what a task! First of all, Despeaux contacted architect Jacques Cellerier, telling him to come quickly to lick the theatre into shape; he asked for a great number of workmen to be sent to him, and also requested his assistance in finding the necessary furniture for receiving and lodging all the guests. Then he met with the actors of the Comédie française: They were asked to come "on Sunday to the château of Mortefontaine, where you will have luncheon and supper, and will perform whatever you wish." He did the same with the musicians for the great concert. He ordered a beautiful fireworks display. They worked day and night and finally everything was ready on time and was a marvellous success. Three large tables had to be laid out in the Orangery, in three adjoining rooms. The first was the “Room of the Union” or the reconciliation, as was written in large gold letters above the door. The second and third bore the names of Washington and Franklin. The busts of these great men were displayed and their names inscribed on escutcheons supported by the flags of both nations. The bust of Washington was sculpted by Houdon. Facing the American ministers, a scroll hung unfurled to represent the ocean; at the bottom, on the right, was Philadelphia, and on the left, Brest and Le Havre. Above that, soared a figure representing Peace bearing an olive branch from France towards America. A large amount of foliage was used to decorate the walls. In the small park, close to the bridge that spanned the stream, an obelisk had been erected on a base decorated with two allegorical figures: France and the United States swearing allegiance at the altar of Liberty, Peace and Unity. Mr. Murray recorded his impressions in his diary of the two days he spent in Mortefontaine. Thanks to him, we know many details about the progress of the festivities, but even more interesting are his opinions on all and sundry, particularly on the Bonaparte family. We will quote him often, as he was such an attentive and extremely well placed witness. “At half-past four, a cannon announced the arrival of the First Consul who, in the minutes that followed, arrived in a carriage drawn by six white horses, with guards in front and behind. He entered the salon, where the assembly rose. He was in the uniform of a Colonel of his personal guard, with a blue tunic with a red and white collar, and a sword. He was very gracious. Five minutes later, he proposed that we go for a walk. We strolled alone among the trees for half an hour. His conversation centred on the rapprochement between our two nations." The entire Bonaparte family, the two other Consuls, and all the ministers and members of the diplomatic corps were there. There were also the Presidents of the Senate, the Legislative Assembly and the Tribunate. Various people who had been in the United States for any reason at all, such as General Lafayette, Monsieur de la Rochefoucauld-Liancourt, as well as American citizens in France, were invited. There were a great number of pretty women to be seen, particularly Caroline Murat and Pauline Leclerc, Napoleon’s young sisters; only Elisa was absent. “Joseph Bonaparte is gentle, quiet, and slightly lazy; he is prudent but not timid, has a pleasing personality, and adores hunting and his estate. “Madame Bonaparte, the mother, is a charming 46-year-old-woman, who seems as young as the Consul’s wife. “Lucien Bonaparte, the Minister of the Interior, appears very attached to his two young children; his wife died six months ago..."
“Before the play began, Bonaparte conversed with the actors Garat and Frédérick; he appeared very knowledgeable about music. His voice is articulate and serious; his demeanour is the very opposite of insipid or bland; he is sometimes pensive, is neither pretentious, nor egotistic, and is very precise in all his movements. What he says always expresses a broad outlook and bears on important ideas. He speaks with such frankness that you think that he is telling you everything and keeping nothing back. He is an extraordinary man and he is too generous for his French enemies. Generosity will be his weakness and his ruin.” Around midnight, in a set specially constructed for the occasion, the finest actors of the Comédie-Française presented Le jeu de l’amour et le hasard by Marivaux, with great success. There were notable performances from Fleury, Dazincourt, Melles Contat, Mezerai and Devienne (who as a charming Lisette made a strong impression on Mr. Murray). That memorable day ended at three o'clock in the morning. In conclusion, one can say that Napoleon, by reconciling the two republics, was the father of two hundred years of uninterrupted friendship between the United States and France. In these troubled times, the château of Mortefontaine deserves rejuvenation. It could become a study centre for peace, justice and harmony in the world.